St George's church sits in the village centre set back from the prominant right-angled bend that the B1107 makes in the centre of the village. 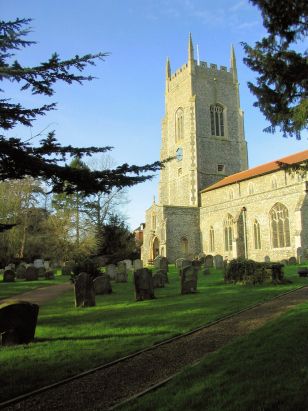 In a large an pretty churchyard it is a big church fitting the size of the population. 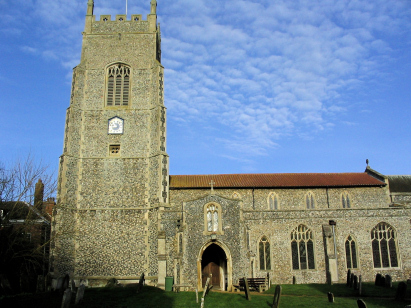 Most of the church dates from the 13th century but like most Norfolk churches it has been much modified over the centuries. This transcript was prepared from Microfiche 8 to 11 in the collection of the Norfolk Record Office. This filming is elderly and it shows in the quality of the inages which is misty and faint. Several portions were a difficult read and unfortunately this was not helped by some rather eccentric hand-writing from the clerks. The period from 1813 through the mid 1820s was probably the most diffcult period to read and an error free transacript cannot be guaranteed for this parish regrettably. The standard of hand-writing improves through the latter part of the transacript and it is to be hoped that this improves the quality of the transcript.